A 77-year-old man was injured while ascending an escalator at the new Hudson Yards 7 train stop Wednesday. HUDSON YARDS — A 77-year-old straphanger was injured at the new Hudson Yards 7 train stop Wednesday morning after slipping on one of the station’s steep escalators — the longest in any city subway station — and hitting his head, witnesses said. 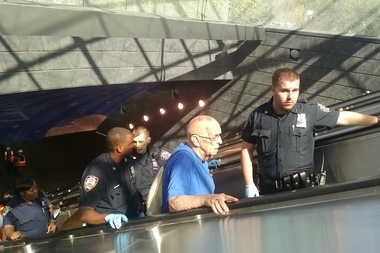 Walter Scheafer, of Co-op City, was riding the up-escalator, which is about 109 feet below street level, when he lost his footing and slipped about 10:45 a.m.
Riders, MTA workers and police officers rushed to help Scheafer, who had scrapes on his head and leg. The up-escalators were shut down for about 20 minutes following the incident, the latest in a string of hiccups at the new $2.4 billion station. On Monday, an escalator broke at the stop and earlier Wednesday, trains were temporarily halted at the station due to a signal malfunction. Another witness said Scheafer was about 20 steps up when he went down. “I was 10 steps behind him and he fell — a lot of blood,” said rider Jim Bopp, 70. An MTA spokesman warned straphangers to be careful when using moving staircases. "Customers should always exercise caution on escalators and hold on to the handrails," MTA spokesman Kevin Ortiz said. Scheafer appeared to take the fall in stride and was laughing with police officers after.